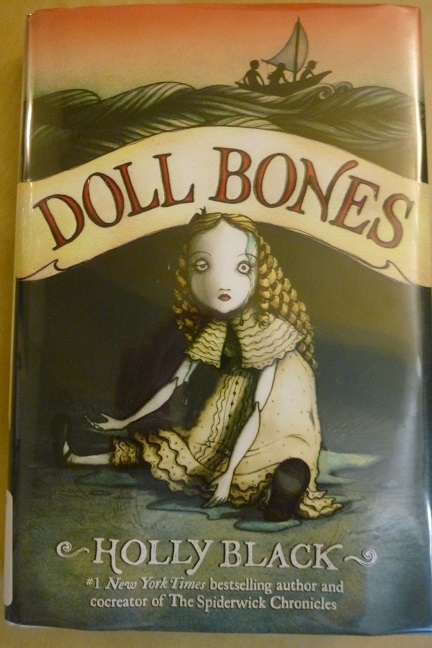 I saw Doll Bones by Holly Black make the blog rounds recently, and I knew it would be a perfect one for RIP…because what’s spookier than a haunted doll? I love the theme of coming to terms with growing up. In a sense it’s a Coming-of-Age story, but not in a Hero’s-Journey way. It’s more a struggle with Peter Pan, with being forced to grow up when there are things about childhood that you don’t want to lose. Zach is the primary focus, but all three kids have that struggle. Alice looks the most mature (and I love a moment when Zach sees her from a distance and realizes that, if he didn’t know her, she would look like a teenager) and that pushes her into having to deal with more mature interactions. Poppy feels like Zach and Alice are growing up without her, while she still feels the same. I love the uncertainty that persists through most of the book, as we don’t really know if there’s actually something magical going on, or if Poppy is making a last bid to hang onto her friends and the Game. Even while we don’t know if it’s true, a thoroughly creepy ghost story is revealed in bits and pieces as the book goes on. I found all three kids likable and believable, and all of them had real, relatable problems–without this ever turning into a “troubled teen” book. It stays upbeat and positive, but with real-world trouble as undercurrents. I’d really like a sequel about Poppy, as I feel like there was more to explore with her especially. The book winds up very satisfying…and while I won’t give the details away, the kids did reach a good place about growing up–and realizing what you don’t always need to let go of in the process. I love the cover too – pretty creepy for its type. Great review, sounds like a good read. This looks really neat. I love the cover!